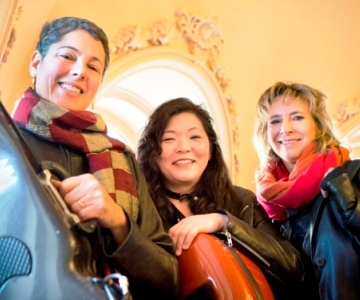 Strings Theory Trio announces their 2015-2016 season of directed improvisation with music composed and performed by Mimi Rabson (five string violin), along with Helen Sherrah-Davies (five string violin) and Junko Fujiwara (cello). Strings Theory Trio; photo by John Soares. Oct. 2, 2015 - PRLog -- Strings Theory Trio has just announced their 2015-2016 season consisting of 4 concerts that allfeature their signature "directed improvisation," composed by Mimi Rabson and performed by Rabson with Helen Sherrah-Davies, and Junko Fujiwara. Combining idiomatic flexibility, a deep wellspring of creativity, and world-class virtuosity, Mimi Rabson is one of the Boston area’s most valuable musical resources — and her current Strings Theory Trio brings together some of her most important influences and inspirations. JP Concerts featuring Strings Theory Trio.Saturday, October 24, 2015, 2 pm. General admission $10. St. John’s Episcopal Church, 1 Roanoke Ave., Jamaica Plain 02130. Further info. : 617-524-2999, info@jpconcerts.org, www.jpconcerts.org/jpconcerts/dotnetnuke/Calendar.aspx. Advent Library Concert Series with Strings Theory Trio plus others. Friday, November 13, 2015, 8 pm. Suggested donation $10. Church of the Advent, 30 Brimmer St., Boston 02108. Further info. : 857-383-9786, shoe4@verizon.net, www.shoebei.wordpress.com. Strings Theory Trio. Wednesday, January 20, 2016, 7:30 pm. Free and open to all. David Friend Recital Hall, 921 Boylston St., Boston 02115. For information: 617-710-5932, mrabson@berklee.edu, www.berklee.edu/events/strings-theory-trio (https://www.berklee.edu/events/strings-theory-trio). Loring-Greenough House Concert Series with Strings Theory Trio.Sunday, April 10, 2016, 2 pm. Suggested donation $5. Loring-Greenough House, 12 South St., Jamaica Plain 02130. Further info. : 617-524-3158, info@loring-greenough.org, www.loring-greenough.org/events. Strings Theory Trio (www.mimirabson.com/mimirabson.com/Strings_Theory_Trio.html).With leader Mimi Rabson’s five-string violin and the equal voices of Junko Fujiwara on cello and Helen Sherrah-Davies on five-string violin, the Trio supercharges the intimate atmosphere of chamber music with a triple dose of edgy, daring improvisation. Listening to these virtuosi, one hears Western classical tradition anew; the surging counterpoint and crystalline instrumental sonorities gain new resilience and allure from their origin in the inspiration of the moment. Simultaneously delicate and dangerous, the Trio’s music is richly nuanced and deeply satisfying. A sample of their most recent recording project can be viewed at www.vimeo.com/soamel/stringstheoryflashback. Background information on Junko Fujiwara can be found at www.junkocello.com and Helen Sherrah-Davies at www.helensherrahdavies.com.